EDITOR’S NOTE: Updated at 7 p.m. EDT (2300 GMT) to correct schedule for first Crew Dragon mission. SpaceX technicians at Cape Canaveral are readying for the first launch of an upgraded Falcon 9 rocket configuration next week, a mission that will debut changes to make the launcher safer for astronauts and make it easier — and less expensive — for the company to reuse first stage boosters. 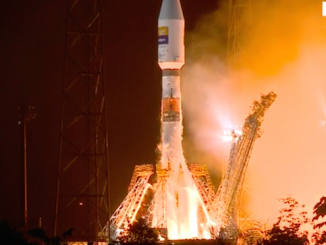 The launch, currently planned for May 4 during a launch window that opens at 4 p.m. EDT (2000 GMT), will loft the European-built Bangabandhu 1 communications satellite for Bangladesh. The upgraded rocket, known as the “Block 5” iteration of the Falcon 9, is a brand new vehicle that was recently delivered to the Florida spaceport after a final full-duration test-firing of its nine Merlin 1D engines on a test stand at SpaceX’s development site in McGregor, Texas. The changes include updates to make the Falcon 9 rocket meet NASA’s human-rating requirements, and introduces modifications to allow SpaceX to recover and reuse first stage boosters with greater speed. A hold-down engine firing of the Falcon 9 rocket is planned Monday, April 30, at launch pad 39A, the former Apollo- and shuttle-era launch complex at NASA’s Kennedy Space Center in Florida. Liftoff from pad 39A will follow May 4 after ground crews return the rocket to SpaceX’s nearby hangar for attachment of the Bangabandhu 1 satellite. It will be the first rocket launch from pad 39A since SpaceX’s first Falcon Heavy launcher, made by bolting three Falcon 9 first stage boosters together, lifted off from the Space Coast on Feb. 6. 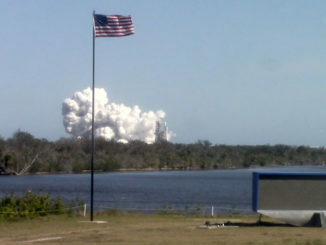 “Block 5 basically summarizes all that we learned on reusability,” Koenigsmann said. “Whenever we recover a booster and then it goes through refurbishment, we find things that are giving us … lessons for the next block. In this case, we tried to summarize all of these lessons learned into a booster that then is able to fly, and be recovered and fly again multiple times without a lot of refurbishment. One of the major changes on the Block 5 version of the Falcon 9 is the addition of more resilient heat shield material at the base of the rocket’s first stage, according to Koenigsmann. The Block 5 engines can also produce more power and feature a redesign to make the engines easier to reuse on multiple flights. The Block 5 version of the Falcon 9 will also incorporate changes to meet NASA safety requirements for launches with astronauts heading for the International Space Station. “Block 5 is the last big spin on Falcon 9, and it’s largely driven by the upgrade that we needed to make for the commercial crew program, as well as national security space launch requirements,” said Gwynne Shotwell, SpaceX’s president and chief operating officer, during a question-and-answer session with reporters last year. NASA awarded contracts to SpaceX and Boeing in 2014 to ferry astronauts to and from the International Space Station. SpaceX’s Crew Dragon capsule will take off on Falcon 9 rockets from the Kennedy Space Center, and the company plans an orbital test flight with two astronauts around the end of this year, although NASA officials expect the first crewed demonstration flight in 2019. SpaceX engineers also added a permanent fix on the Block 5 upgrade to resolve a concern with turbine wheel cracks inside the Merlin engine’s turbopump, and new helium tanks that are not susceptible to pooling frozen liquid oxygen and friction that led to the explosion of a Falcon 9 rocket on the launch pad in 2016. 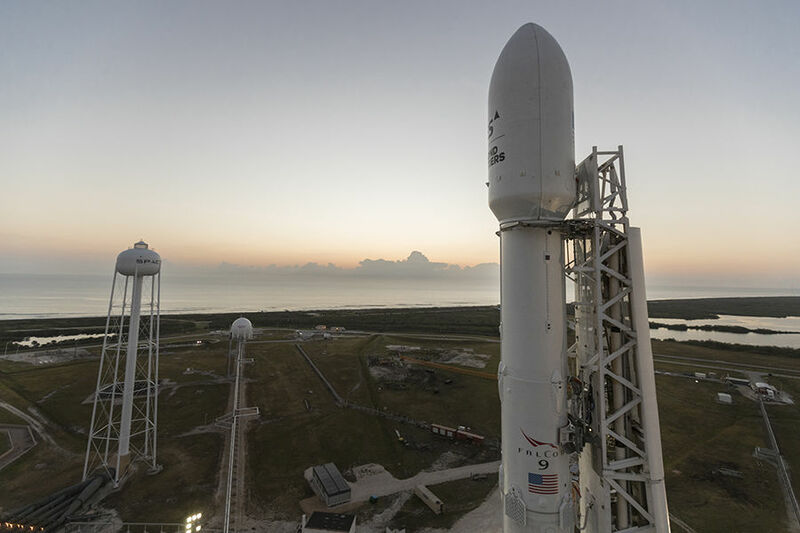 Block 5 is the most significant upgrade to the Falcon 9 rocket since SpaceX debuted the “full thrust” configuration in December 2015, which was the first time the company used super-chilled, densified RP-1 kerosene and liquid oxygen propellants. Since then, SpaceX has flown beefed up titanium grid fins to replace the single-use aluminum steering wings used during the descent of the Falcon 9’s first stage. A Falcon 9 launch from California in February debuted a slightly larger payload fairing. Both enhancements are expected to regularly fly on Falcon 9 Block 5 missions. In an interview on “The Space Show” online radio program last summer, Shotwell said the Block 5 is important for SpaceX’s ambition to reuse Falcon 9 first stage boosters more often, and at less expense. Boosters based on earlier Falcon 9 designs can be reused two or three times, but a Block 5 first stage could be reused “a dozen or so” times, she said. The ultimate objective of the Block 5 upgrade is to make the Falcon 9’s first stage capable of flying up to 100 times with refurbishment, SpaceX officials have said. The Falcon 9 Block 5’s first stage is designed to launch up to 10 times with minimal rework between missions, according to SpaceX. The fastest turnaround between flights of the same Falcon 9 booster to date has been approximately five months, and no Falcon 9 first stage has flown more than twice. Components on the Block 5 rocket, such as valves, were planned to be requalified and redesigned at more extreme operating conditions and for longer durations, she said on The Space Show. Other changes on the Block 5 upgrade include new landing legs that can be retracted without the need for recovery teams to remove them from the rocket, and the interstage structure that connects the first and second stages will be black and unpainted. The first stage’s engine section, known as the “octaweb,” will be bolted to the bottom of the booster on the Block 5 configuration. 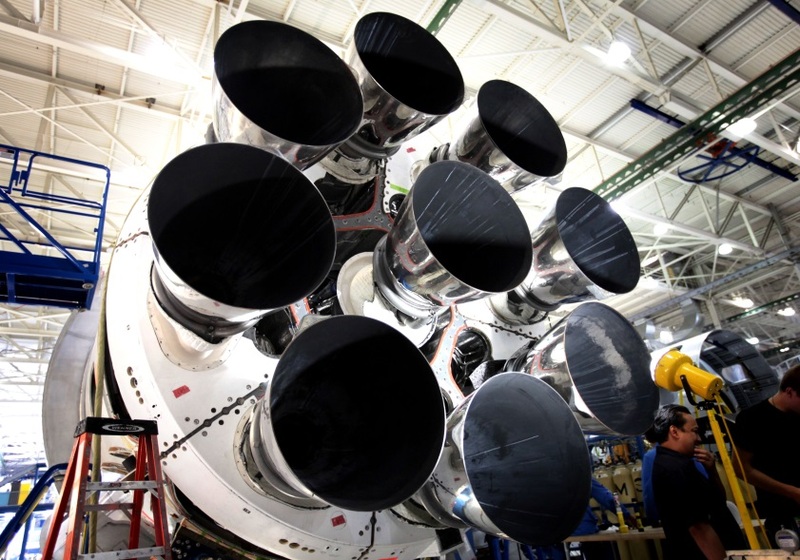 The octaweb arrangement, which sets the first stage’s nine Merlin engines at the bottom of the rocket and routes liquid propellants to the powerplants, was welded to the rocket on earlier Falcon 9 designs. The previous version of the Falcon 9 rocket will fly a few more missions after the Bangabandhu 1 launch. Two additional Falcon 9 flights are planned later in May — one from Vandenberg Air Force Base in California and one from Cape Canaveral — and both will use previously-flown first stages. 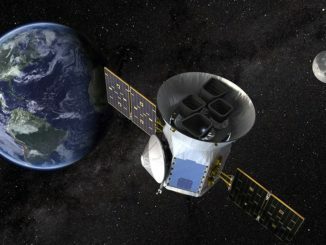 The last newly-manufactured “Block 4” Falcon 9 launched with NASA’s Transiting Exoplanet Survey Satellite on April 18. The booster landed on SpaceX’s drone ship in the Atlantic Ocean, and SpaceX plans to reuse it on the company’s next resupply launch to the International Space Station in late June, pending final NASA approval. The Bangabandhu 1 communications satellite set to launch on the maiden Falcon 9 Block 5 flight arrived at Cape Canaveral on March 30 after a trans-Atlantic flight aboard an Antonov cargo plane from its Thales Alenia Space factory in France. Built in Europe for the Bangladesh Telecommunication Regulatory Commission, the dual-band satellite will provide Ku-band and C-band television broadcast and data relay services across Bangladesh and surrounding regions. 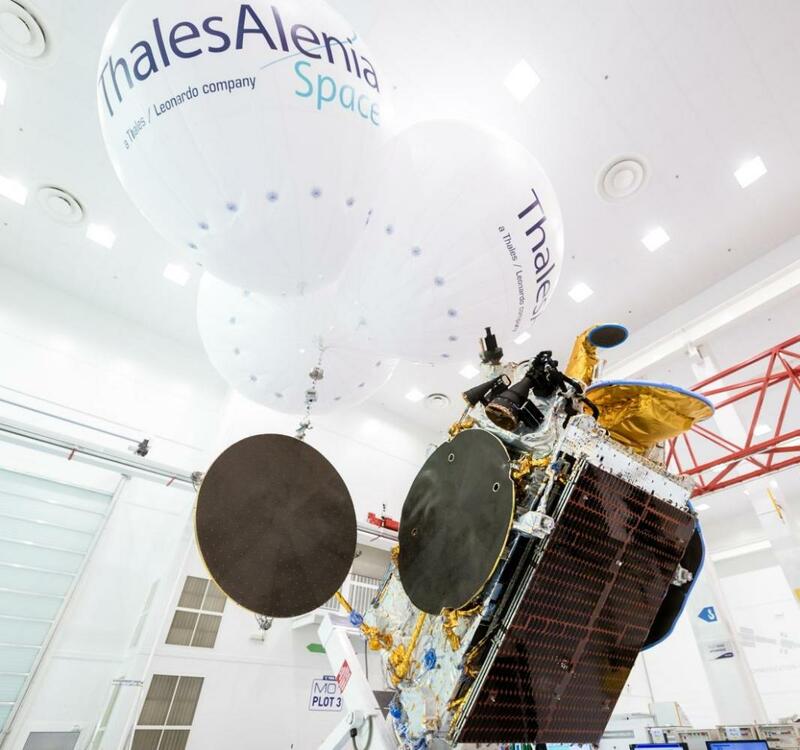 Thales Alenia Space will deliver the Bangabandhu 1 satellite to its governmental operator after launch. The so-called “delivery-in-orbit” arrangement puts Thales Alenia Space in charge of building the spacecraft, procuring launch services, and ground tracking and control infrastructure.